Give an Easter corsage this season to show how much you care. Flowers are an important part of any Easter celebration. They not only add a decorative touch but are a great way to welcome spring. Spring represents renewal and Easter for Christians represents the resurrection of Jesus. This time of year is the perfect time to incorporate the use of flowers. Flowers used at Easter represent renewal and abundance and can be worn as corsages in addition to being used for centerpieces in the home and to decorate churches. When selecting flowers for Easter, choose colorful blooms that have special meaning. A gift of flowers is the perfect way to show someone special how much you care. Floral corsages are popular for women to wear to church on Easter Sunday. Consider getting a special corsage to give to the woman in your life at Easter. She will not only enjoy wearing it to church but will appreciate the sentiment behind it as well. If considering a corsage for Easter, you must first decide whether you want it to be worn on the person, used as a wrist corsage or attached to a handbag. 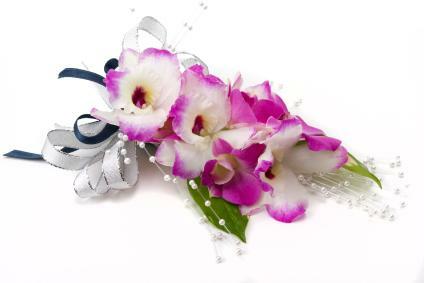 With so many possibilities for corsages, it is best to keep in mind the style and preferences of the recipient. For example, if someone is allergic to fresh flowers, you should choose a corsage made from silk flowers. There are many ideas for Easter corsages from the most simple to the most elaborate. A simple flower with a decorative ribbon is one idea to consider. Choose a flower specific to the Easter season such as a lily. Another option is to choose a mix of small flowers to use in the corsage. Pastel colors such as pink, yellow and purple are great for Easter as well as white flowers. An Easter corsage makes a great gift for mothers, grandmothers, godmothers, aunts and anyone else who means a lot to you. If you want to give a gift of flowers for Easter, instead of a planted flower, try a corsage. If you have decided on a traditional Easter corsage that can be pinned to the clothing, be sure that you place it in the right spot. A corsage should be pinned on the left by the shoulder area. It should also be in a location that looks good with the clothing it is being worn with. Always be careful when pinning a corsage on someone. The pin should not go through the stem but should go over the stem at an angle. Push the pin through the fabric then place it at an angle over the stem and back through the fabric. Be sure that the tip of the pin is not sticking out. A second pin can be used for added security. A wrist or handbag Easter corsage require less care. These corsages are simply worn around the wrist or attached to a purse. They are a safe option for those not wanting to bother with pinning or for those whose clothing may not support the weight of the corsage.